This feature is available only if you use unweighted assignment groups in your course. When assignment groups are weighted, points cannot be displayed for the total grade. Access the Gradebook for your course and scroll to the Total column. Hover your cursor over the column header until the blue toggle arrow appears. Click the blue toggle arrow and select the Switch to points menu option. Canvas will confirm you want to switch to points. 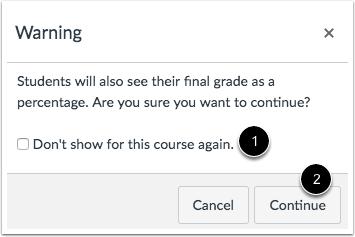 If you do not want to see this warning message for your course again, click the Don't show... checkbox . View your students' point values in the Total column. You can switch back to percentages by clicking the blue toggle arrow in the Total column and selecting Switch to percent. 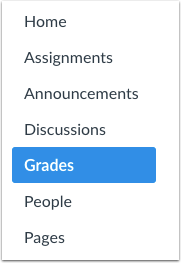 By default, total grades are shown as a percentage with two decimal places. 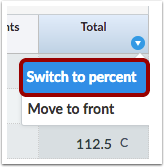 Canvas will confirm you want to switch to a percentage. 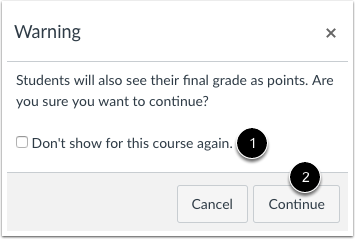 If you do not want to see this warning message for your course again, click the Don't show... checkbox . Previous Topic:How do I view a student's submission details page in a course? Next Topic:How do I sort columns in the Gradebook? Table of Contents > Grades > How do I view my students' total grades as a point value instead of a percentage in the Gradebook? Re: Can I turn off total percentage calculation? Re: How do I delete the summary columns in the gradebook? Re: Hi! I am trying to change the settings on Grades so I can see what the TOTAL amount of points for assignments is. I want to make sure they add up to 1000.